Welcome to the Printing Partners Binding Guide. Click on a binding type below to select the type of binding method you would like more information about. A description and list of advantages and disadvantages are available with a photo showing the binding. Wire-O, spiral and GBC are types of mechanical binding in which pages and cover are held together by a metal or plastic coil. Though more expensive than wire stitching, mechanical bindings allow their contents to open wide and lie perfectly flat. Advantages: Lies flat; pages can be removed without deletion; adaptable to different paper types; offers singe-sheet insertion for flexible page count; bindings come in a wide variety of colors. Disadvantages: Greater expense; can detract from project aesthetics. Many annual reports and larger catalogs use this binding method. Here, pages are assembled in groups or signatures, and bound together with flexible adhesive, then covered. 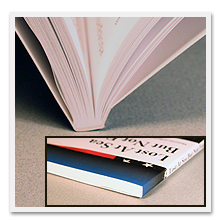 Perfect binding accommodates books approximately 1/8-inch to 2-inch in thickness. 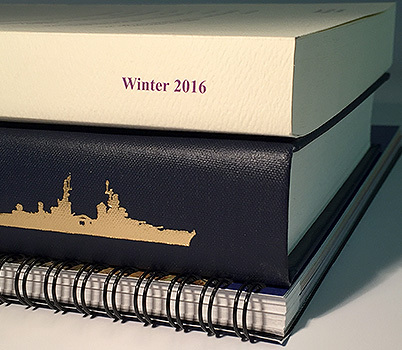 Advantages: Accommodates greater number of pages and higher page weights than saddle-stitch; accommodates multiple sheet weights and sizes; allows intermix of stocks; provides clean finished edge. Disadvantages: After pages are collected into signatures, the binding edge is ground off to improve adhesion. That, along with a three-knife trim, takes approximately 1/8-inch from each side of a document. Does not lie flat; crossover images and type may be partially hidden by the binding edge. Case, or edition binding is the conventional method used in most hardcover books. Sheets are folded into 16- or 32-page signatures, pasted with end leaves and sewn together. This process culminates in a hard cover, which ensures durability for years to come. Advantages: Provides perfect crossover of images from page to page; archival quality. Disadvantage: Most expensive binding method. 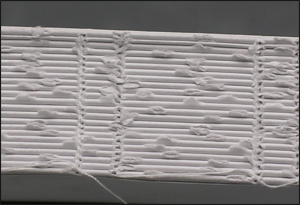 The saddle wire stitch allows the book to lie flat for reading ease. It can be bound with either a self-cover, or a separate cover. It is the most economical solution. 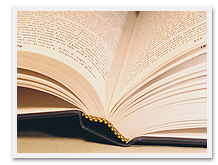 Advantages: The saddle wire stitch allows the book to lie flat for reading ease. It can be bound with either a self-cover, or a separate cover. It is the most economical. Disadvantage: The page count must be divisible by four. This restricts the number of pages. It is the least flexible of all binding options. Smyth Sewn (also known as Section Sewn) book bindings are a very high quality book binding. They are considered library quality, archival safe books because the pages are physically sewn into the book using binders thread and then further reinforced with a fabric backing and adhesive to create a usable and durable book binding. This binding is also best used for books with large numbers of pages. Advantages: This binding stands up to years of wear and tear. They are inherently tamper evident. You cannot remove a page from a book without destroying the integrity of the binding. Typically it is required by research companies for documenting intellectual property for patent filings. Books with Smyth Sewn bindings lay completely flat, making them easier to read and write in. Disadvantage: This binding can cost a little more than a standard case or perfect bind.